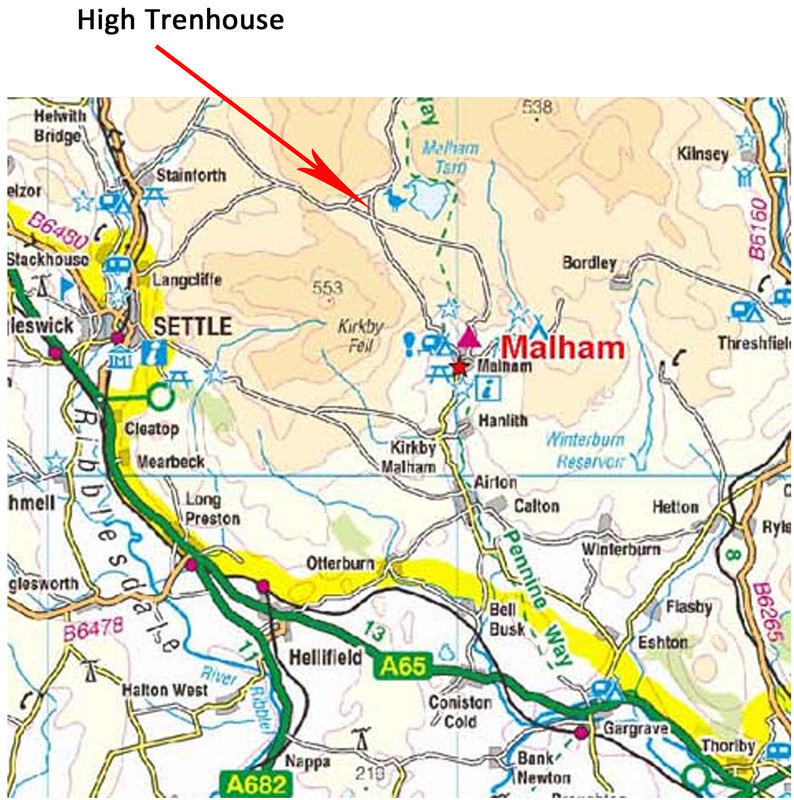 High Trenhouse, Malham, BD24 9PR is very easy to find as there is nowhere really to go wrong because it is out in ‘the sticks’ but that also means that you might feel a bit ‘out on a limb’ if you are unsure of where to go. I have taken a few pics of points along the way to help you out. Apparently Sat Nav’s can be a little unreliable once you get to Malham. If you need help with directions you can contact High Trenhouse on 01729 830322. The first group of pics show the route if you are coming from the Skipton/Gargrave side, most likely if you are using the M1 motorway. The second set of pics is for if you are coming from the Settle side of Malham, most likely if you are using the M6 motorway. If you are coming from the Lake District, I am assuming that you will be able to find your way to Settle and you will pick up the directions from the River Ribble where the road turns left towards Horton in Ribblesdale, there will also be the brown sign to Watershed mill. If you are approaching from Skipton and Gargrave, turn right off the A65 at Gargrave onto Eshton Road, it is signposted Malham, you will drive through the tiny village of Airton and the blink and you’ll miss it village of Kirkby Malham, keep on going straight ahead. Arriving at Malham village you will see the national park building on the left, keep going straight on only another two miles or so to go. Pass The Buck Inn, the road forks keep left. Follow the Malham Cove and Stainforth sign at the fork in the road. The windy road will soon start a very steep climb. As you reach High Trenhouse you will arrive at a cross roads go straight ahead. Look out for the green sign on the sign post it says High Trenhouse. You are only yards away. If you are approaching Malham from the Settle side, my directions begin on the east side of Settle. the second exit is signed Horton in Ribblesdale and the brown sign is for Watershed Mill, which is where my shop is, you will pass the shop en route. The road takes you up a hill, at the top turn right signed Malham. From here you will be ‘out in the sticks.’ Things become very rural and the road very steep and windy. After about 3 miles the road bears round to the left, you will turn off which actually looks like you are going straight ahead. There is a green sign pointing the way to High Trenhouse on the signpost. You will go over a cattle grid. A little further on you will come to a cross roads, turn left; you are only yards away now. When you turn left there is a little hill in front of you, Trenhouse is just over this hill. At the cross roads you may be able to see a murky looking lake, this is called Malham Tarn and is often shown on maps if you check one out before you set off. Once you have turned left at the crossroads you will find the entrance to High Trenhouse. Pull into the driveway and park on the right. you will then make your way down to the front door you see in the back of the photo. Welcome you have arrived. Hi how do I get hold of a quiltofax pattern please. Thank you for your enquiry; if you ring the shop on 01729 824708 we can sort you out, including postage it will be £5.